Progressive weakness. Many health and rehabilitation workers look at muscular dystrophy as one of the more difficult and discouraging disabilities. It tends to be familial, often affecting brothers. It is progressive and, within current medical knowledge, incurable. Duchenne's muscular dystrophy (the commonest type) begins in early childhood and causes increasing muscle weakness. The child - usually a boy - develops trouble walking, and eventually needs a wheelchair. 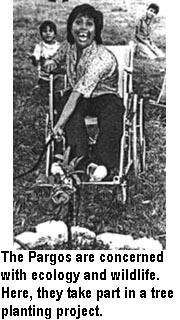 As the weakness progresses, his arms get too weak to push his wheelchair or lift his hands to feed himself. Eventually, the weakness affects his breathing and, usually in his late teens or early 20s, he dies, often from pneumonia. The good news. Despite all this, when given encouragement and a supportive environment, many children with muscular dystrophy live full and adventurous lives, even though they may die young. In this chapter, we tell the story of a remarkable family, the Perazas. 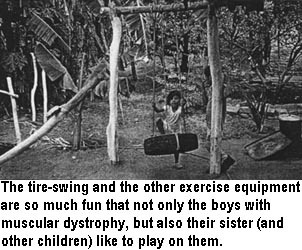 Of their 7 children, 3 boys and one girl - CACHITO, SÓMIMO, JUANILLO, and DINORA - had muscular dystrophy. All were in wheelchairs by age 10. Today, only Dinora is still alive. The boys all died in their teens or early 20s. But, in their short lives, they did some amazing and fulfilling things. THE PERAZA FAMILY lives in a poor barrio of Mazatlán city. When the parents realized that several of their children had muscular dystrophy, they wanted to do all they could for them. In those days it was impossible to get such children into the public schools. Yet the Perazas felt that their children had the same right as other children to attend school. So the family created their own school. Helped by an exceptional social worker, Teresa Paez, the Perazas met with families of other disabled children in the community and collectively started their own education and rehabilitation program for their children. The children themselves decided what to name their group. They called themselves Los Pargos, the name of a local fish which the elite consider inferior, although it provides a good source of food and a livelihood for local fisher folk. The Los Pargos school was organized as a cooperative, in which the disabled children and parents were participating members. Most families were quite poor. To raise money for school supplies and transport, the families made colorful crafts to sell. Outstanding were designs with artificial flowers, mostly made out of fish scales. Parents and children went on work picnics to the sea-shore where fishermen cleaned fish. They collected sackfuls of fish scales. These they washed and sun-dried. Then they stained them various colors and glued them together to make delicate bouquets of flowers. With the help of Teresa Paez, Los Pargos convinced the city government to let them use a local school building after the official school day was over. Eventually the Education Department agreed to pay for a teacher. But the Pargos had trouble finding a teacher who respected and knew how to work with disabled children - until they found Victor. VICTOR, the teacher, was born with athetoid cerebral palsy and began to walk when he was 8 years old. 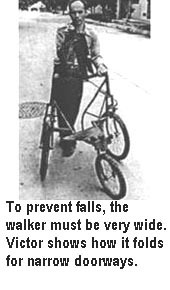 He stands and walks with great difficulty and falls often. When excited (which he usually is) his arms and legs jerk this way and that. He has a slight speech problem. 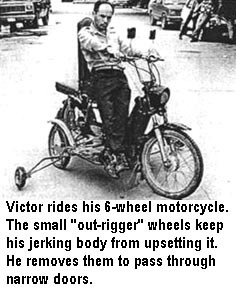 But Victor is avidly independent. From primary school through college, he had to struggle to be accepted. Yet he was a gifted student. He won a scholarship to medical school, but had to drop out because the campus was far from home and his family could not afford bus fare. Since then, he strove to improve his mobility. 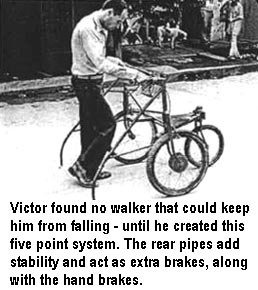 He and a friendly mechanic invented strange and wonderful wheeled devices: walkers, motorcycles, and even a hand-controlled auto. Victor majored in biology and math, and has a teaching degree. For several years he taught at the Pargos school, where he was a wonderful example. He had loving concern for his students, yet did not pamper or spoil them. He challenged each child to do his or her very best. With a role model like Victor, many of the disabled students became junior teachers and creative facilitators for younger children and those who needed more assistance. In this peer teaching process, the Peraza children took the lead. By the time they reached their teens, their dystrophy was advanced. Yet CACHITO and SÓSIMO, the older two brothers, had become very capable organizers and teachers of the Pargos. Sósimo even learned how to read and write Braille, so that he could teach blind children. The Peraza siblings also loved to draw and paint. With practice, they became gifted artists. 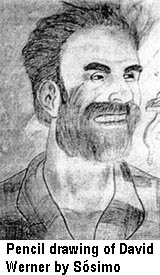 One day when I (the author) was meeting with the Pargos, Sósimo drew the pencil sketch of me shown here. With care and patience, the Peraza children taught other children to draw and paint creatively. 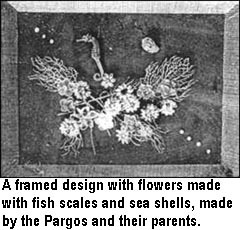 When the Pargos had enough pictures painted and fish-scale flowers made, they periodically held a public sale. 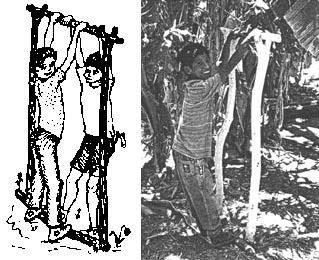 The Peraza children led Los Pargos in the defense of endangered wildlife, with which they somehow identified. One summer, they led a city-wide Campaign to Protect the Sea Turtles, whose numbers were rapidly diminishing due to relentless hunting of both turtles and eggs. 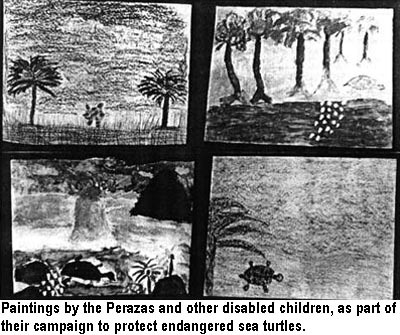 The Perazas asked each Pargito (disabled child) to do a painting of sea turtles as best as he or she could. The resulting collection of paintings was astounding: adult turtles, turtle eggs, and baby turtles of every size and color, swimming, dancing, playing, laying eggs - and being hunted and butchered - in the sea and on the beach of Mazatlán. With the cooperation of the city authorities and local artists, a public event was held to display the sea-turtle paintings (which sold like hot-cakes) and to raise the awareness of the larger community. In their defense of the sea turtles, Los Pargos won people's respect and appreciation for the abilities of disabled children. All four of the Peraza siblings became gifted artists and craftspersons. But Sósimo was the most outstanding. Like the other Pargitos, he had a fascination with the ocean and its creatures. 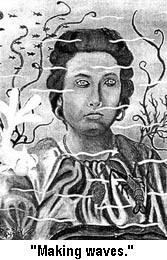 One of his most haunting paintings is the portrait of a woman in the bottom of the ocean. After Sósimo had died, his sister Dinora told me he had painted it "because when people die they go to the bottom of the ocean, and that is what makes the waves." Evolution of Los Pargos. 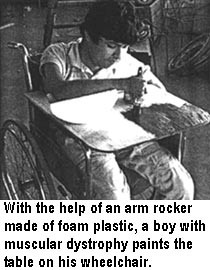 Eventually, Los Pargos gained enough public attention to pressure the local public schools into accepting some less severely disabled children. Even so, many of the Pargitos who began to attend public schools continued to come to Los Pargos' group in the afternoons. Several of the older Pargos took over the management, activism, and teaching responsibilities of the program. Among these were the Peraza siblings, whose leadership skills and ability to motivate others grew with time, even as their physical ability and health declined. 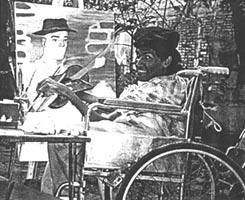 This photo of Sósimo in his late teens reflects his combination of artistic ability, self-determination, and his radiant joy in the creative process. I wish all children with muscular dystrophy, and their parents, could have had a chance to know and learn from Sósimo and his family. As the years went by, Los Pargos grew and expanded. Children with all kinds of disabilities - physically disabled, mentally handicapped, epileptic, deaf, blind, and multiply disabled - came daily from all parts of the city. Transportation was a big problem. At last, with money they earned plus donations by well-to-do patrons in the city, the Pargos were able to buy a second-hand bus - which they named the Pargobus. Periodically the Pargobus would make trips to PROJIMO, in the village of Ajoya, about 100 miles from Mazatlán. The outings served as visits to the countryside and a chance for the children to enjoy the games and equipment in the Playground for All Children. The visits also provided an opportunity for children to be fitted with wheelchairs, orthopedic appliances, special seating, and other assistive devices. Again, the young Perazas often played a leading role in helping to organize these trips. It was amazing what these four youths with muscular dystrophy managed to do, and the pride and joy they took in doing it, even as their physical condition gradually deteriorated. But for all their creativity and problem-solving skills, they could not halt the progress of the disease. 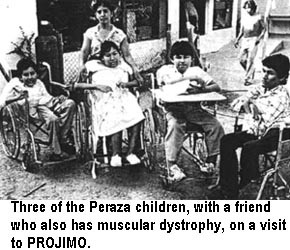 Over a period of several years, one after the other of the 3 Peraza brothers died from pulmonary problems. Today only their sister, Dinora, is still alive. But the dignity, caring, and leadership skills they developed and shared with their peers live on. At present, Los Pargos is managed and run by disabled graduates of the program, some of whom are continuing with their formal schooling and some of whom have jobs. (One of the first members of the Pargos, Miguelito, who has physical and speech difficulties, works in an automobile repair shop, skillfully taking dents out of damaged cars.) Occasionally, the disabled youths who run the program call on the assistance of special educators, teachers, doctors, and therapists when they think their help is needed. But overall, the group takes pride in its autonomy and independence. Recently I (the author) visited the Peraza home and had a long talk with DINORA. She is now almost 20 years old. Her muscle weakness has progressed so that she can not lift her arms. 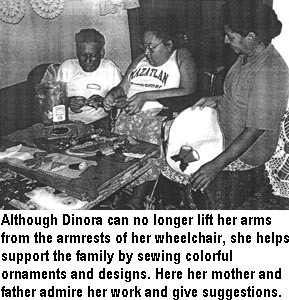 However, she creates lovely hand-sewn crafts by balancing her forearms on the armrests of her wheelchair. She still is active with Los Pargos. Although travel by bus to the Pargos center is now too difficult for her, she teaches English to several of the Pargitos who come to her house. I asked Dinora how she had learned to teach English. She said she had studied at the ACADEMIA DE INGLES THE GOLDEN GATE, a few blocks from her home. Her father took her there daily in her wheelchair. "David, I wish you could meet my teacher, who runs the Academia," said Dinora. "He's a wonderful person. He's disabled." "Is his name José Angel?" I guessed. "Yes!" said Dinora. "Do you know him?" "Years ago, when he was a boy, we took him to Shriners Hospital in California for surgery," I replied. "I haven't seen him for years, but I heard he was teaching English in Mazatlán." That afternoon, Dinora's father took me to visit JOSÉ ANGEL Tirado. 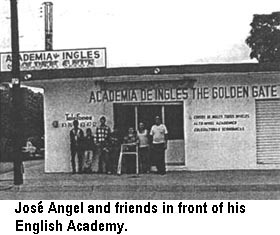 The Academy, next to his father's house, is a great success, with 3 classrooms and 3 teachers. José Angel, who has a rare degenerative bone disease, made many trips to Shriners Hospital in California for surgery when he was a child and an adolescent. Now he has artificial hips and knees. On his many visits to the USA he learned a lot of English. 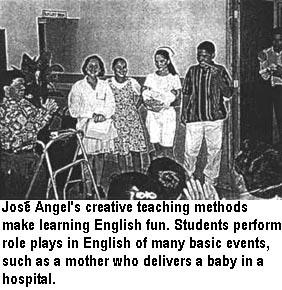 Once back in Mexico, José Angel began tutoring classmates in English, and he eventually started teaching small groups. He was a good teacher who knew how to make learning fun. More and more students wanted him to teach them. So, his father rented a room next door, and that was the start of the Academy. Today, there are 80 students and a long waiting list. 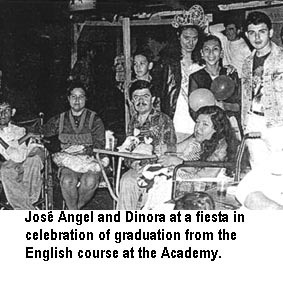 Financially, the Academy has been so successful that José Angel paid for a full renovation of his father's house. He charges enough to make a good living. But for disabled people who want to study at the Academy, he gives full scholarships. A close community. The Peraza family and the Pargos, together with disabled role models and teachers and like Victor and José Angel, form a close community of peers and friends who help, challenge and provide inspiration to one another. Despite their difficulties, there is an aura of warmth and even joy about the Peraza home. Every time I visit the Peraza's, I come away with new energy and hope - not so much hope for a wonder drug to cure muscular dystrophy (although that would be marvelous), but rather, hope for humanity. The Peraza family and their children with muscular dystrophy somehow found unusual strength and vitality. The children made the most of their lives, however short, finding pleasure in helping others in need. We can learn a lot from them. Their spirit lives on. Three of the four Peraza children are no longer physically present. But each of them, until very shortly before his death, found great pleasure and dignity in helping other children in need. The remarkable abilities they developed were not limited to their artistic creativity. They inspired disabled and non-disabled people to do their best, and to bring out the best in one another. Their short lives, far from being tragic, were full and rewarding - with joys, sorrows, challenges, and adventures - as life should be. CHIRO and RICARDO are two brothers with muscular dystrophy, from a village called Limón. (Child-to-Child activities to help school children be more accepting of these boys are described in Chapter 45, on page 300.) When their parents brought the brothers to PROJIMO, they were at a loss as how to help their sons. They had taken the boys to a rehabilitation center in the city where they had been given a number of exercises to stretch their tight heel cords and to try to maintain their muscle tone. But the boys whined and complained when their parents tried to apply the exercises, which were anything but fun. At PROJIMO, Mari encouraged Jesús and some of the other disabled children to introduce Chiro and Ricardo to different activities in the Playground for All Children. 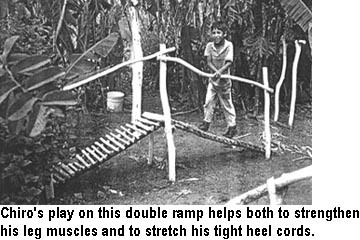 Playing on the ramps and swings, the boys engaged in exercises that stretched their tight heel-cords and helped them use many muscles of their bodies. And the boys enjoyed it. 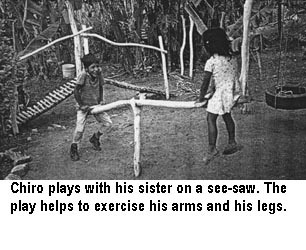 Inspired by the PROJIMO playground, the boys' father decided to build at home some of the playground equipment that his sons most enjoyed, and which provided necessary exercise. The following photos show some of the equipment he built, with the help of his sons, behind the family hut in their village. Heel-cord stretcher. This apparatus, invented by their father, also helps Ricardo and Chiro stretch their tight heel cords. This is done by stepping on the pole on the ground with the front part of the foot, and then rocking back and forth. The device also helps exercise the child's shoulders, arms and hands. Standing with the fore-foot on the pole on the ground helps to stretch tight heel-cords. The bend in the pole - so that it slants down to the center from either side - helps combat inward (varus) deformities of the feet.